Published by iPay International S.A.
Stay safe with the GateKeeper Authentication method and add an extra security to your Account. If you enable the GateKeeper authentication method, you will log into your accounts with a special one-time confirmation code generated from this app. 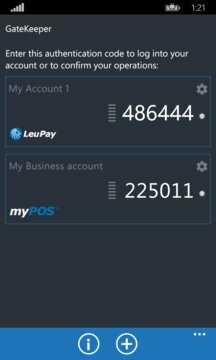 The generate codes are unique for each of your accounts and constantly changing. With GateKeeper you can control multiple accounts. In order to work GateKeeper should be linked to the Account you want to secure. Turn on the GateKeeper authentication method from your Account Profile page and follow the instructions there. 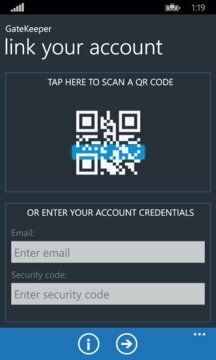 It is quick and easy and will take you less than a minute to link your account with the GateKeeper app. The app will generate authentication codes that will be required for account log-in or payments confirmation. Add an extra layer of security!